Contribute to the vital work to conserve nesting sea turtles in Ghana. 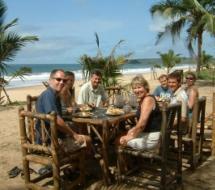 Stay in shared accommodation at a guesthouse in an idyllic beachfront location on the West coast of Ghana. Get involved with the local community, providing educational workshops in the fishing village and schools. 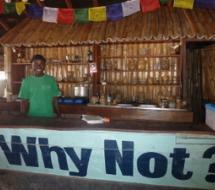 For those with an interest in eco-tourism an opportunity to learn about the sustainable practices at the guesthouse. A rewarding and fun experience, which will provide the chance for a life changing cultural exchange. You will be based at Green Turtle Lodge, which has been established as an eco-tourism guesthouse and has been working closely on development projects with the local communities since 2003. This strong relationship and connections with the community has led to a better understanding of the challenges and requirements of the people who traditionally rely predominantly on fishing for food and income. As a result, the volunteer programme puts an emphasis on community involvement at every level. The community is consulted on any programme planning from the outset and communicated with at all stages of development. By listening to the community and responding to their requests it is ensured that the projects do not impose Western ideas and any initiatives are genuinely welcomed and of benefit. In return, the community is enthusiastic in its support for the projects and working alongside volunteers. As a volunteer at this project you will have a worthwhile and enjoyable volunteering experience. No volunteer will be replacing or taking the job of a local person. However, you will not be sitting on the sidelines; you will be getting involved and getting your hands dirty. You should not underestimate the motivation and interest that is created by having foreigners in the village, taking an interest in their life and culture. As well as being a huge challenge and tremendously rewarding the volunteer project offers an unforgettable experience, fun and adventure. You will be volunteering in a tropical paradise; a deserted stretch of palm-lined beach with a backdrop of tropical rainforest. This means that in between your volunteer work, which we expect you to put your full energy into, you can relax by the ocean in a traditionally styled guesthouse, unwind and mingle with a diversity of interesting people. As a volunteer on our Ghana Turtle Conservation and Eco-Tourism Project you will work alongside staff to promote conservation both to tourists and the local community. There are three types of sea turtle nesting on the beaches in Ghana: the Olive Ridley, the Leatherback and the Green Turtle. All of these turtles are endangered species. It is very important that we protect these fascinating creatures from the dangers they face. The Ghana Wildlife Society is worried that, “given the current rate of killing the turtles, they will soon be extinct.” Fishermen and other members of the local community who may come across the turtles are not aware of the importance of protecting them. This unfortunately means that sea turtles are killed and the meat is sold or the eggs are poached from their nests. Therefore, you will play a vital role in the protection of the sea turtles and their conservation in Ghana. Your responsibilities will be diverse; they will include beach patrols, research, education of the community about the importance of conservation, training and working alongside local guides on eco-tours, and communication and interaction with tourists. 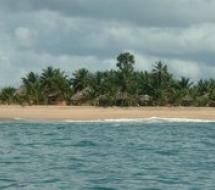 The conservation area, Akwidaa Beach, is a five kilometre stretch of palm fringed beach. Female sea turtles emerge from the sea at night to lay their eggs (October to March) and this is a very vulnerable time for them. You will be paired with a local member of the turtle beach patrol and take your turn in a set number of night patrols of the beach to monitor turtle nesting and to prevent the females from being disturbed whilst laying. You will be involved in data collection and analysis. It is important to monitor the different species of sea turtle laying on Akwidaa Beach. For example, which type of sea turtle is most commonly found on our beach, how this compares to previous years and to other beaches in Ghana. You will also be involved in mapping and recording where and when each type of turtle lays its eggs. Conservation of the sea turtles will only ever be effective if it has the support of the community; killing turtles and poaching eggs must stop. Fishermen and villagers need to be educated about why they should not kill turtles and what the possible benefits of the turtles are to them. Part of your role will be to co-ordinate workshops with the local fishermen and visit schools in the area to educate the community on the importance of protecting sea turtles. You will assist in the weekly ‘Wildlife Club’ held for pupils of the local schools. There will be opportunity to be creative here with projects such as drama, story-telling, designing posters or signboards for the village. Tourists are fascinated to see and learn about the sea turtles and the conservation efforts that have been initiated. There are organised guided hikes available nightly, which tourists can pay to join in the hope of seeing a turtle nesting or the fascinating passage of the hatchling turtles back to the ocean. The turtles are not the only thing worth conserving in the area, as the beach is backed by mangrove swamps and rainforest. Eco-tours explore these areas as well and include canoe trips through the mangroves and hiking trails through the rainforest, bamboo forest and rubber plantation. These tours create employment and the money tourists pay to go on them goes directly into a community fund, which pays a fair wage to the guides and is used for conservation purposes, such as buying materials and paint for sign boards or batteries for night patrol torches, or for community projects, such as building toilets or repairing water pumps. As part of the project you will be involved with promoting responsible tourism practice to guests, including the community based activities mentioned above. You will encourage and advise tourists about responsible behaviour on these trips. You will also attend and run some of the tours, assisting the guides and be involved in their training and assessment. For example, helping canoe guides to identify birds or hiking guides to identify plants in the forest and in explaining about these to the guests. All materials and full support will be provided. Those with an eco-tourism background or interest will also find the opportunity to gain an insight into how an eco-lodge operates interesting. This includes utilising, managing and maintaining renewable energy sources and self-composting toilets. I particularly enjoyed the opportunity to be part of community life; to speak in church about conservation, to teach the children about the eco system and about the different species of turtles. Just getting to know the local people including the people who once poached turtles and stole the eggs, was fascinating. I was able to understand the challenges around the ‘obruni’ coming in and telling them to simply stop poaching, when this was something that they had done for years. The days were fun packed and varied. I used to coach Moses, one of the Turtle Guides on how to do a guided tour and what to say to encourage tourists to donate more generously. It took patience and understanding due to language barriers and at the same time was immensely rewarding to help him develop his skills. Each night Chelsea and I would conduct beach patrols searching for tracks or even better, a turtles coming into nest. These could be anytime from 2200 to 0600 and used to take us between 2 hours and 4 hours depending whether we found anything. 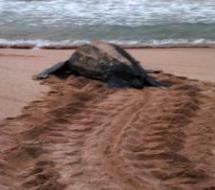 During the month of January we were lucky enough to sea a Leatherback and an Olive Ridley nesting. They were amazing sights and I felt very privileged to be part of it. Data at the moment is limited so we just recorded the basics however as the project moves on much more is needed in order to eventually try to ensure the beach becomes a protected conservation site. Educating the children was brilliant. As is so often the case, the best ideas were the simple ones. I ran one lesson where we made a frieze on the classroom wall to show underwater life. Something as simple as sticking sand on the bottom of blue card to show the ocean floor brought gasps of delight from both young and old. So, my advice would not be to over complicate matters. Stick to the simple and ensure you have a clear message to communicate and make it fun. When we saw children playing at the weekend in the sand and making turtles, we began to feel our message was hitting home. The living conditions on the project are the best I have encountered as a volunteer. You will find you live in an oasis overlooking a stunning beach, in natural eco tourist surroundings, delicious food and friendly staff. This all makes leaving so much more difficult! The Ghana Turtle Conservation & Ecotourism Volunteer Project has a start, or arrival, and departure date every second week on a Sunday. The turtle nesting season is between September and March, so the project is only open during these months. You should arrange your flights to arrive into and depart from Kotoka International Airport, Accra for the set dates. You will arrive on the Sunday, stay overnight at a hostel in Accra and then be accompanied by a staff member on public transport to the project location on the Monday. Here you will meet your project managers, Jo and Tom, who will provide you with your orientation. This will include a familiarisation of the local area, information about Ghana and Akwidaa Traditional Area, background information about turtle conservation and turtles in Ghana, the mangrove eco-system, the bio-diversity of the local area, the eco-tourism tours and the knowledge level of the guides that you will be assisting. Other topics will include health and safety, cultural considerations and behaviour, and project ethics and guidelines. You will meet the chief of Akwidaa village and be given an introduction to the local language. 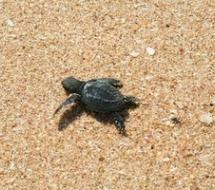 You will also have access to resources and information about sea turtles and wildlife in Ghana. 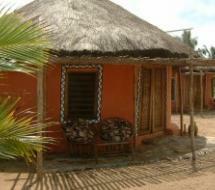 You will stay in comfortable shared African style beach chalet rooms at Green Turtle Lodge. The lodge is in a remote area in the Western region of Ghana and situated on a long stretch of magnificent palm-fringed beach. Each chalet has its own solar panel providing the energy. Mosquito nets are provided and rooms are cleaned, although volunteers are expected to do their bit to keep things tidy. You will use the guesthouse ablutions, which include open air showers and seated (environmentally friendly) self-composting toilets. Showers are cold water, but with Ghana’s climate this almost always welcome. Three meals per day are provided. Breakfast will be a choice of eggs, muesli, toast, tea or coffee. Lunch will be a light meal usually consisting of a sandwich or salads. You will choose your dinner from the lodge menu. Purified water will be provided, but other drinks are at your own expense from the bar. There is no internet at the lodge and mobile phone reception is not great. However, a signal can be obtained at certain points around the lodge. The best way of communicating is by text and arranging a suitable time to make or receive phone calls. You are lucky enough to be staying in shared accommodation on the beach with views of the ocean. During your free time you may simply relax and unwind, read, or play board games. If you feel more active you can play football, beach volleyball, table tennis or table football with the staff or other tourists. It is also possible to go hiking or canoeing in the surrounding area, although organised excursions are not included in the programme fee. You should arrange your return flights to Kotoka International Airport in Accra (please do not do so before we have confirmed your booking). A project representative will meet you at the airport and will transfer you to your overnight accommodation in Accra. You will have dinner with a programme co-ordinator and any other volunteers who have arrived on the same day, which will provide an opportunity to chat about life in Ghana in general. The next day, Monday, you will be accompanied by a local co-ordinator on public transport to the project location near Dixcove. The journey will take about 5-6 hours. At the end of your programme you will travel back to Accra independently for your return flight or onward travel arrangements and this is not included in your programme fee. 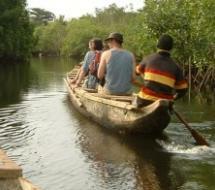 You should be confident to do so by the end of your stay in Ghana and the project staff will help you to arrange this. However, if you would prefer a private transfer the project staff can also book this for you. Whilst you are at the turtle conservation project in Ghana you will have the support and assistance of the project managers and team 24/7. This will ensure that you receive the encouragement and advice that you need, are able to give and receive feedback, and can provide input and ideas. This is a small focussed project, which means you will benefit from individual attention. Should anything arise that your project managers are unable to resolve then you should contact our UK office by telephone or email. You will also be provided with an emergency contact number in the UK before you depart, which should be used for genuine emergencies only outside normal office hours. You do not need to have any previous training or experience of conservation. We are looking for self-motivated, enthusiastic individuals with an interest in conservation and community-based eco-tourism.